Myeongdong dates back to the Joseon Dynasty when it was called Myeongryebang (Hangul: 명례방; hanja: 明禮坊) and mostly a residential area. During the Japanese era the name was changed to Myeongchijeong (Hangul: 명치정hanja: 明治町, Meijicho in Japanese pronunciation) and became more of a commercial district, being influenced by the rising commerce in the neighboring Chungmuro area. It became the official district of Myeongdong in 1946, after independence. After the Korean War and into the 1960s, the economy blossomed and the financial sector from Namdaemun-ro and Euljiro gradually expanded into Myeongdong. The area flourished as city renovations took place and high-rise buildings were built. Many department stores, shopping centers, restaurants, upscale shops and boutiques set up their businesses in Myeongdong and it became the mecca for the young and trendy in the 1970s. Besides being a major commercial and financial district, Myeongdong has been a popular location for political demonstrations and protests, especially during the turbulent years of the 1980s and 1990s. Myeongdong Cathedral has been a frequent spot for many of these demonstrations and still is to this day. As of March 2000, Myeongdong's has been designated as a special Tourism Promotion Area and is one of the stops on the official Seoul City Bus tour's main route. Seoul's financial hub is divided between here and Yeouido where the Korea Stock Exchange is located. Major insurance, securities, financial services companies, and investment firms with headquarters in Myeongdong include Citibank, SK Corporation, Kookmin Bank, Korea Exchange Bank, Lone Star Funds, Sumitomo Mitsui Banking Corporation, AIG Korea Insurance, Hana Bank, and HSBC. The Bank of Korea is also in the vicinity. Other notable landmarks in Myeongdong include the Chinese Embassy, which was first opened on January 4, 1949. YWCA headquarters, UNESCO Hall, Myeongdong Theater, and the oldest Catholic cathedral in Korea, Myeongdong Cathedral. Except for early morning and late night delivery hours, the main street and most of the alleys are blocked off for pedestrians to roam freely without being hindered by traffic. Myeongdong (명동) is one of the busiest number 1 shopping district in Seoul and is among Korea’s premier primary shopping destinations. Over 1 million shoppers pass through this area each and every day and being located in the heart of Seoul, Myeongdong is well known to be Korea’s modern-day history as a center of city politics, economy, and culture. Its wild popularity has led to similar shopping districts springing up all across the country. The two main subway lines which meet in the center of the district begins from Myeongdong Subway Station (Seoul Subway Line No. 4) and Lotte Department Store at Euljiro. . The area’s well-developed transportation grid makes it the ideal place for visitors who may not yet be familiar with the city. Aside from shopping, visitors can check out the Myeongdong Cathedral and the nearby Namdaemun Market, a market with over 600 years of history. Myeongdong’s combination of historical significance, nearby tourist attractions, and prime shopping has established it as the ultimate tourist destination in Seoul. In a poll of nearly 2,000 foreign visitors, conducted by the Seoul Metropolitan Government in November 2011, stated that 13.4 percent named shopping in Myeongdong as their favorite activity in Seoul. If you purchase items that are more than 30,000 won at a shop where you are eligible for tax refund, request for a tax rebate form – you will typically be given a blue or orange colored form. Fill it up and submit for tax refund in cash at one of the tax refund outlets here in Myeongdong or at the Incheon airport if you depart back to Singapore. All skincare/cosmetic/beauty products outlet are eligible for tax refund and it is quite easy to estimate up to 30,000 won (about 30 USD) with your purchases! To international visitors, Myeongdong is a stunning shopping district with countless shops and restaurants. The air is abuzz with the mix of foreign languages as shopkeepers and international tourists negotiate prices in English, Japanese, and more. Many brand name shops, department stores, vendors, and restaurants line the streets and alleys. 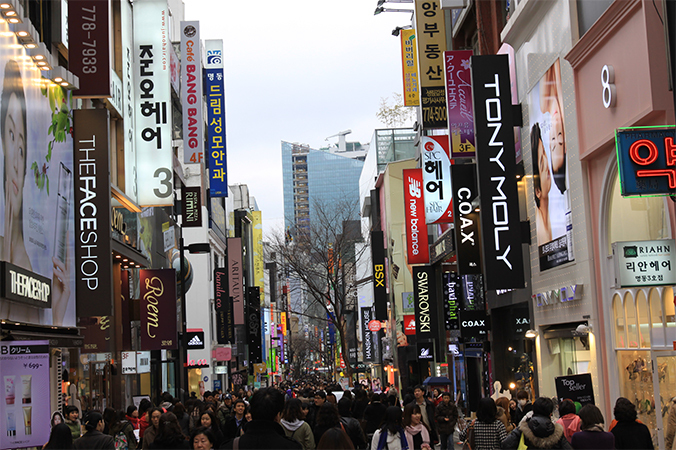 Common products for sale include clothes, shoes, and accessories and unlike Namdaemun or Dongdaemun, many designer brands are sold in Myeongdong. In addition, several major department stores include Lotte Department Store, Shinsegae Department Store, Myeongdong Migliore, Noon Square, and M Plaza which are the most popular places of visit. The department stores carry many premium labels and other fashionable goods at reasonable prices that are satisfactory to all types of shoppers. For people who love mall shopping and following the latest trends, the eye-catching glass exterior of M Plaza draws in passers-by to its big-name stores including Spanish fashion chain, ZARA and Forever 21. On the 5th floor is Haechi Hall, a performance space where you can catch a concert or a musical and M Plaza is also home to the Seoul Culture and Tourism Center. Active types wear are specialized in Noon Square which has sports and casual wear shops as well as having a cinema and seafood restaurant. Myeongdong is full of beauty outlets. Every Korean cosmetic brand has a branch in Myeongdong. The market is home to roughly a thousand cosmetic shops and hundreds of skin-care stores, with several large cosmetic shops clustered around the central street (Jungang-gil) and Myeongdong Theater. Sales associates usually can speak a few foreigner languages (to some degree), which makes for a pleasant shopping experience for international visitors who don’t speak Korean. For the added convenience of international shoppers, many fliers are written in other languages as well. TODACOSA is a cosmetics chain stocking a wide range of brands and is Korea’s first large specialized cosmetics store. Since opening in 2000, TODACOSA has prided itself on unprecedented levels of service, allowing customers to sample any product before purchasing and offering a special make-up corner to test foundations, eyeliners, lipsticks, et cetera. Olive Young, which opened in 1999, is a health and beauty concept store stocking product lines ranging from cosmetics to health foods and has proved popular with women of all ages. Myeongdong is also home to several Korean big-brand shops including The Face Shop, Etude and Missha which draw in many overseas visitors too. Myeongdong also has family restaurants, fast food, plus Korean, Western, Eastern Asian, and Japanese dining options. Many restaurants in Myeongdong specialize in pork cutlet (donkas) and kalguksu (thick noodles). There are also many street food stalls serving traditional Korea delicacies such as fish cakes, tteokbokki (a stir-fried dish made of rice cakes with vegetables in hot sauce), soondae (steamed pig’s intestines stuffed with bean curd, soy bean sprouts, green onions, starch noodles and mushrooms) as well as new food inventions like the potato tornado! So if you don’t have time for a proper sit-down dinner/lunch, just grab some food on the go, shop through a few shops/street stalls and then grab something else from the next food stall and continue on! Myeongdong Tourism Information Center is located at the Myeongdong Jungang-ro Intersection, this information center employs two guides who can provide assistance to visitors in English, Japanese, and Chinese. As an added convenience, there are a number of multi-lingual guides free-floating around the Myeongdong area, ready and willing to assist tourists. Just look for people wearing red vests marked with an ‘ⓘ’ information logo. Myeongdong Festival has been hosted since 1982 to vitalize the commercial area and encourage tourism. It is usually held twice a year: from the end of March to the middle of April in spring, and the month of September in autumn. Parades, music and dance performances, fashion shows and other spectacles are part of the festivities. Many shops and stores offer product sales and discounts during this time as well. In 2012, the area hosted the street parade of the Cheonan World Dance Festival in October. Myeongdong is very popular with international visitors and fills with Japanese tourists during the Japanese holiday period known as “Golden Week” which runs from the end of April to the beginning of May. Part of Myeongdong’s popularity stems from the more affordable prices here compared to Apgujeongdong and Cheongdamdong. Myeongdong Theater opened in June 2009 after renovation of the old National Myeongdong Theater, and is known as a special theater for play performances. The Architecture of the Outer area was built in a Baroque style in 1934 and within the theater is a modern style performance facilities which blends in well harmoniously. While it was about to be sold to Korea Total Finance in 1975 and be torn down, citizens including Kim Jang Hwan, chairman of Myeongdong Co-op of Shopkeepers, organized a campaign for the relief of this theater in 2003, and the Ministry of Culture and Sports purchased the building and restored it. Restoration of the Myeongdong Theater played a pivotal role in the ‘Seoul Full of Life’ moto. As the single textile art museum that exhibits textile arts of Korea and abroad, it displays the passed down traditional quilt skills that has disappeared and now promotes the Korean textile arts to the whole world. "Korea Shooting Club," located in the center of Seoul, Myeongdong, is where you can experience shooting with live ammunition! This location is well-known as a filming site for dramas and movies, "Korea Shooting Club" boasts the largest number of firearms and the best facilities for shooting in the country. Guided by a safety guard and offering high-tech safety devices, anyone can enjoy shooting. Cost: For 10 shots, it costs 40,000 KRW and 50,000 KRW depending on the caliber of the gun. For those who want to try shooting, it is required to show either your passport or a certificate of alien registration. Following recent renovations, the Myeongdong branch of O’Sulloc Tea House now offers visitors an even more elegant and comfortable place to relax and immerse themselves in the wonderful world of tea. A true paradise for green tea lovers, the bar-like counter on the first floor allows visitors to talk face-to-face with tea sommeliers and get detailed information about the tea. The first floor even has a section where customers can pick their green tea and watch it brewed. A large cauldron at the entrance is used to roast the fresh tea leaves. The second floor of the teahouse is a cultural space for visitors to experience green tea; the third floor has a meeting room, presentation equipment, and an outdoor terrace. If you’re in a hurry, don’t worry! The teahouse also offers take-out services so customers can enjoy the flavors of Jeju green tea on the go. The main branch of Lotte Department Store which was opened in 1976. Situated in Myeongdong nearby Euljiroipgu station (Line 2 Subway) being connected with Young Plaza and Lotte Hotel, it attracts hundreds of travelers and visitors from all over the world. The Department Store is composed of 14 stories including the Lotte Duty Free Shop and the premium AVENUEL store which offers luxury brand goods. It basically has everything and offers a variety of discount and sales options to allure shopping customers. Nanta is a must-see nonverbal comedy performance in South Korea which incorporates traditional Korean samul nori music. Hitting on large drums to create a rhythm is samul nori (something like the Japanese taiko drums). The word samul means “four objects” and nori means “play”; samul nori is performed with four traditional Korean drum-like musical instruments but in the case of Cookin’ Nanta, it is performed with improvised instruments that you can find the kitchen e.g. knives, cutting boards and large containers. The story is about three cooks in a restaurant trying to prepare a wedding banquet within a tight deadline while the manager disrupts the process by putting his incompetent nephew among the kitchen staff. You don’t have to understand a single word of Korean as the performance is almost completely non-verbal. When they do speak, it is mostly in English. Overall, it is a very interesting and fun experience catching the Cookin’ NANTA show. It is 100 minutes long and it is interesting to see how they improvise on kitchen items to produce music. The Myeongdong NANTA Theater is located right in the heart of Myeongdong.